Book Review "An Inside View of the Coin Hobby in the 1930s: The Walter P. Nichols File"
Will the Efficiency of the TPGs Naturally Lead to all Worthwhile Coins Becoming Overgraded? In my experience, few aspects of grading cause as much consternation among as large a pool of collectors as hairlines. I am not writing about the male-pattern baldness that may affect a disproportionately larger segment of the numismatic community, but am instead writing about those delicate lines that seem to pop up out of nowhere to limit the grades of so many coins. My years on the bourse have taught me that there are myriad ways that hairlines can manifest themselves on coins and that some of these ways should be considered natural while others are, unfortunately, due to ill advised actions. 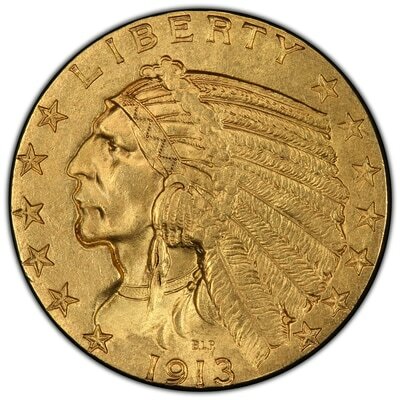 Before I get too far into this article, I will write that the only images of coins to be shared here are coins that I own. That is, I do not want to look for examples of obviously cleaned coinage in the collections or inventories that belong to others since I do not wish to potentially limit the liquidity or value of items that belong to others. This brings up a bit of a conundrum as I do not own any examples of cleaned coinage, so I will share problem-free coins and describe their properties. The only exception to this is a single medal that was offered online in a PCGS cleaned holder and that had a PCGS Secure image associated with it and freely available. Fortunately, I have an example of the same medal in essentially FDC full-bloom and will use it to contrast the two. ​Hairlines will not preclude a problem-free or straight grade from PCGS or NGC, but they may be used to limit the grade assigned. 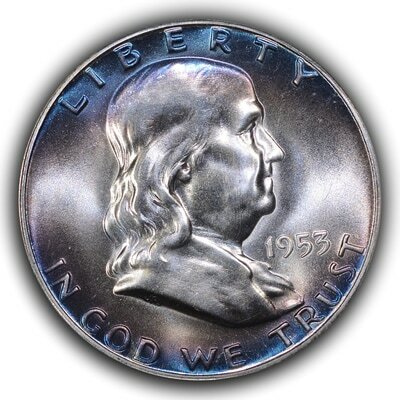 For business strike coinage, hairlines will most likely be visible on untoned pieces (the prototypical “white” silver coin) and can be found with greater frequency and severity as the MS grade falls. However, once the coin achieves the grade of AU58 the acceptable extent of hairlines typically drops before rising with a lower grade toward AU50. 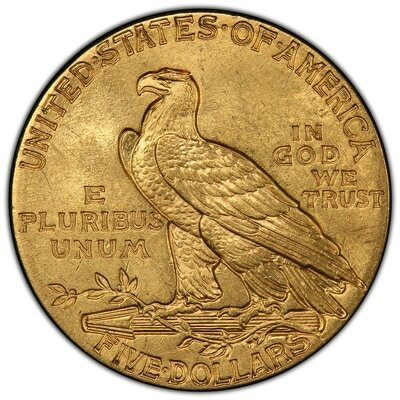 This is one reason why many folks refer to an AU58 as an “MS64 with rub” in that the coin will have attributes of a higher grade, but the light rub on it will limit the coin to AU58. 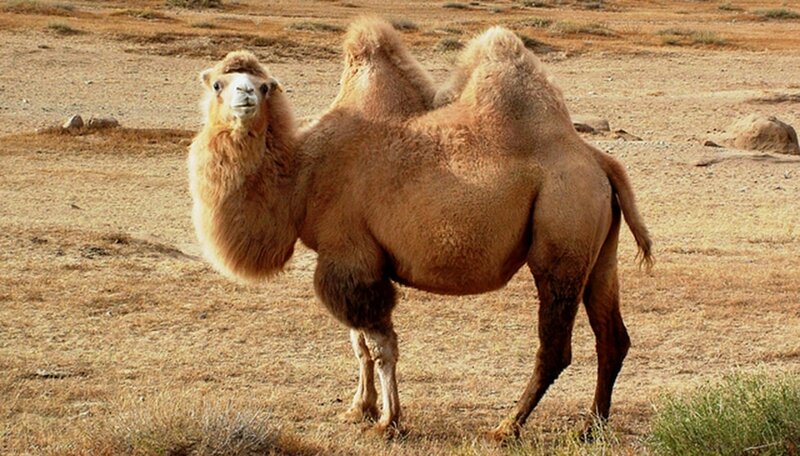 This can be thought of as a bimodal distribution or, for those not into statistics, two camel humps. You looking at my bimodal distribution? Reverse of 1806 Draped Bust quarter showing fine die cracks, a bit of retained cud and obviously clashed dies. Hairlines are caused by any contact by and subsequent movement of material against the surface of a coin. They can be caused by small, airborne minerals in dust, from an ill advised wipe with a cloth or by sliding a coin against a hard surface such as a marble countertop. Random acquired hairlines will generally be in many directions and often be concentrated on either the large open fields of a coin or on the highest portions of a portrait. 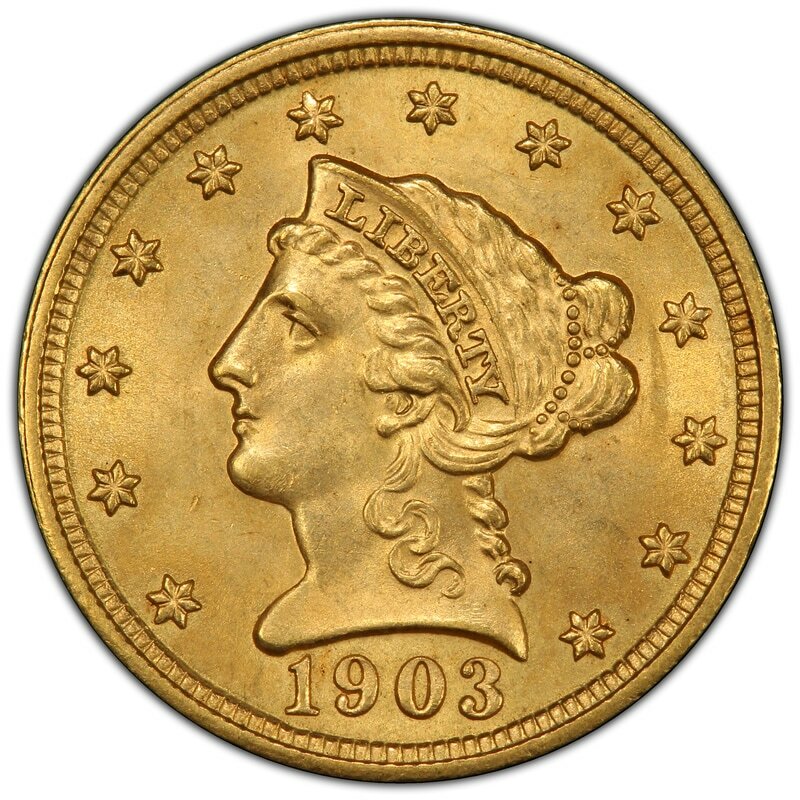 On AU coins this is often considered regular circulation wear, on MS coins it can be greatly grade limiting and on brilliant proof coinage it can result in the grade being hammered. ​Something that is definitely different from hairlines are die cracks and roller marks. Fine die cracks can sometimes fool collectors into believing they are hairlines, but the larger and chunkier die cracks seldom fool anyone. The reverse of the 1806 Draped Bust quarter, at the left, show fine die cracks, among other early US Mint features, all along the reverse. These are as-made and are not considered a grade limiting defect, though some collectors would rather they not be on the coin at all. 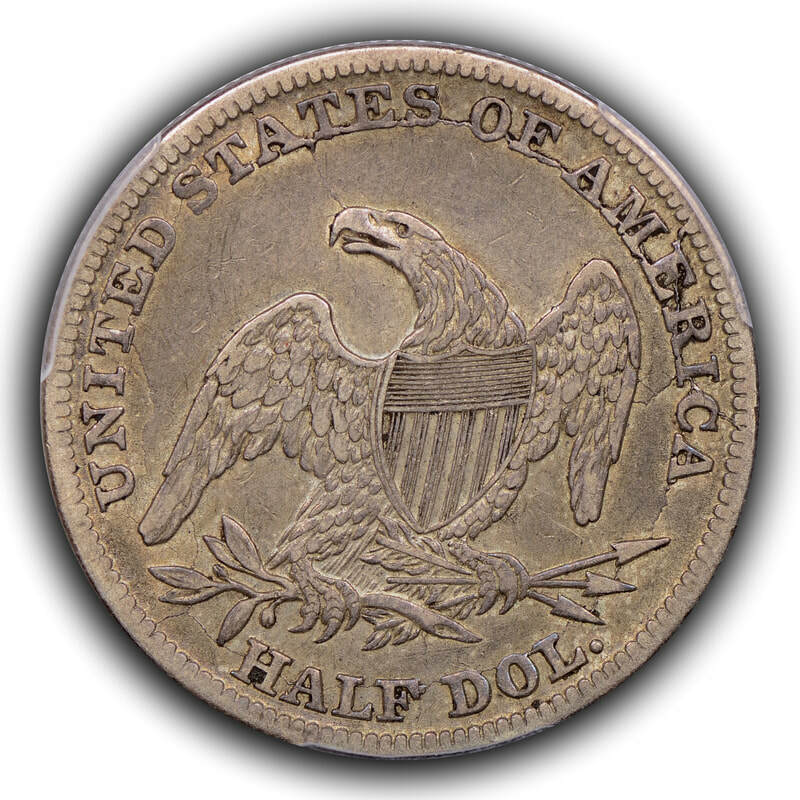 Larger die cracks such as on the reverse of the 1838 and 1839-O RE half dollars imaged rarely pose as hairlines. 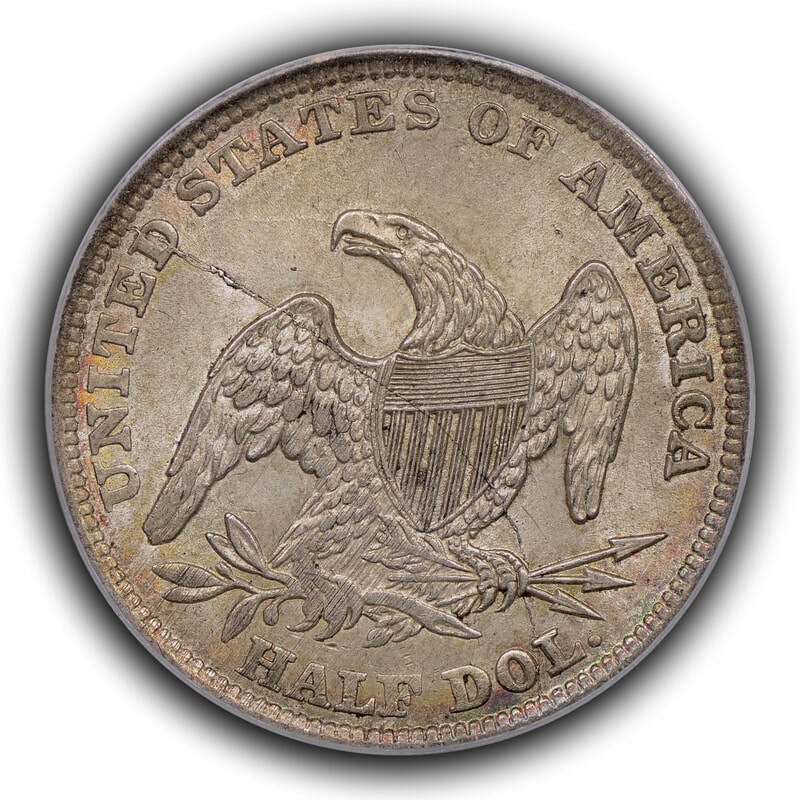 However, roller marks can be deceptive and are seen in conjunction with die cracks on the reverse of another 1838 RE half dollar. Again, these are as-made from the US Mint and do not limit the grade on pieces such as this AU, but they may limit the eye appeal (and thus the grade) on MS coins. 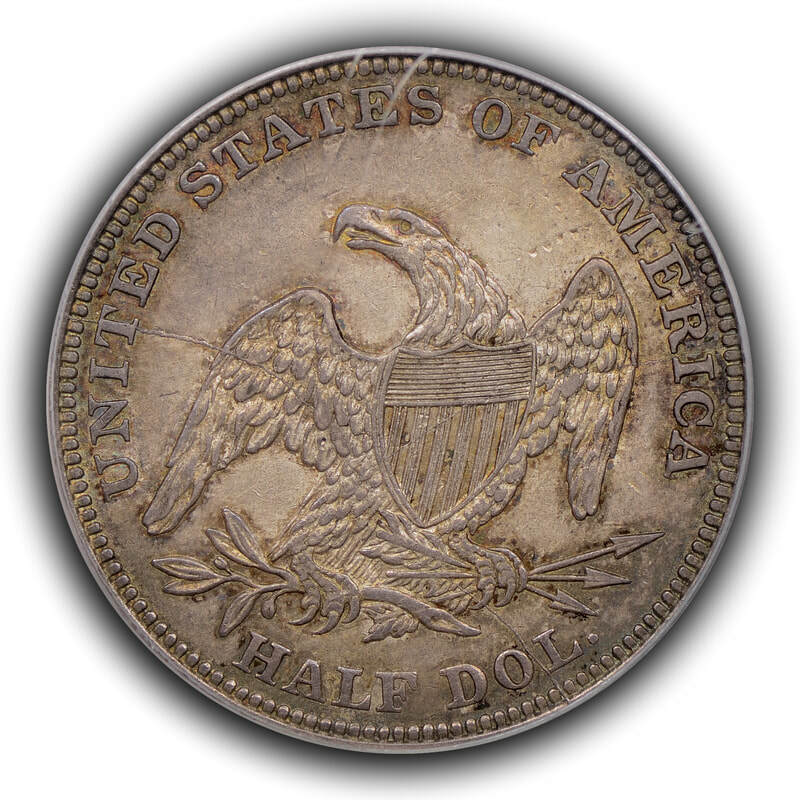 Some die marriages with the Reeded Edge half dollar series are essentially always seen with characteristic roller marks. Reverses of Reeded Edge half dollars showing large die cracks (first and third coins) and one coin showing large die cracks as well as severe roller marks (second coin). The first and second coins are 1838 and the last coin is an 1839-O. An area of US coinage where many folks have issues with grading is the incuse quarter-and half-eagle designs of Bela Lyon Pratt. Pratt produced a pair of stunning issues that employed a common design, but instead of bringing the design out in relief against recessed and flat background, he chose to make the flat fields the highest part of the coins and sunk the design elements beneath them. 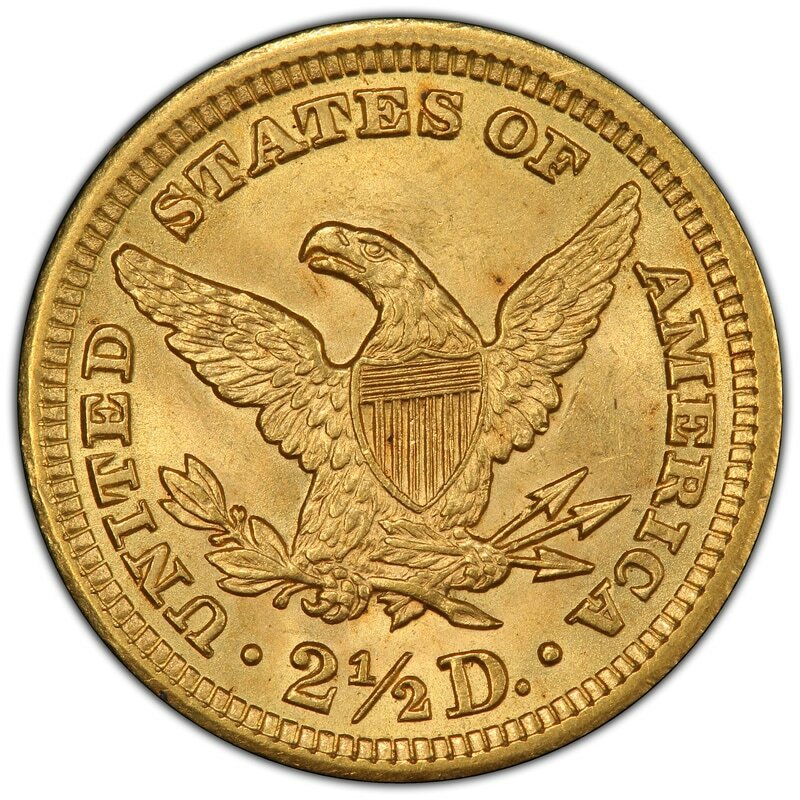 The result is that the designs are in relief as all other US coinage, but they are sunk beneath the level of the surrounding metal in contrast to anything produced to that time. 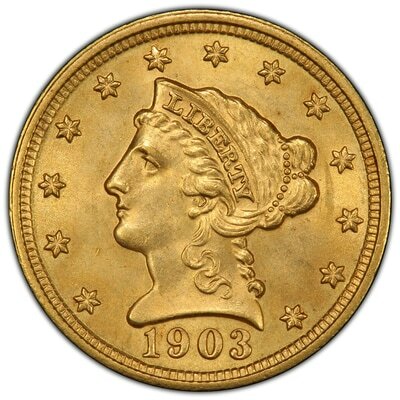 Not only does this give a fair number of folks the fits when it comes time to grade the coins, but it also means that hairlines will often show up first and most concentrated within the exposed fields of the Pratt designs instead of preferentially criss-crossing the portrait and other design elements of traditional US coinage. See the comparison images below for the incuse design of the Pratt coins in comparison with the previous Liberty designs. The obverse and reverse images of an MS Pratt half eagle paired with the corresponding side of an MS Liberty quarter eagle. The Pratt design is incuse while the Liberty design has the conventional raised portrait and devices. Although hairlines show up quite well on the delicate surfaces of brilliant proof coinage, there are examples of coins that are known to have extensive die polish on their surfaces that may appear, upon casual inspection, to be hairlines. Among these are the early 1950s brilliant proof issues of the Washington quarter and Franklin half dollar. Below are images of a brilliant proof 1953 Franklin half, a DCAM 1963 Franklin half and a business strike 1953-D Franklin half. Brilliant proof 1953 Franklin half dollar, brilliant DCAM proof 1963 Franklin half dollar and mint state 1953-D Franklin half dollar. 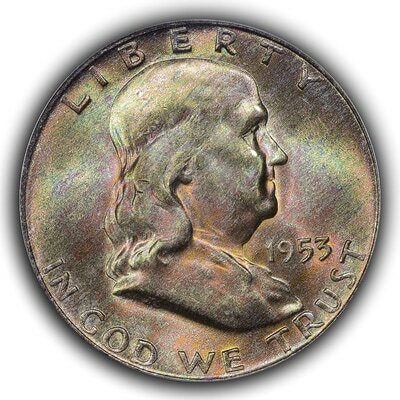 If one looks at the portrait of the brilliant proof 1953 Franklin half dollar there may appear to be hairlines all over the coin. However, these are die polish lines and are as produced by the US Mint. 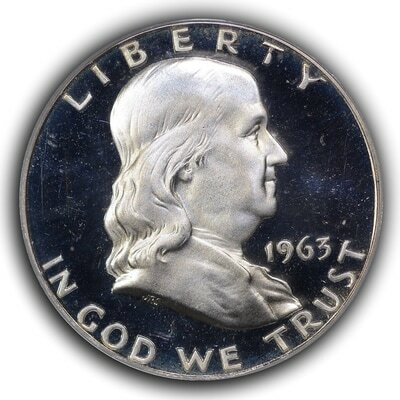 The portrait of Franklin is the lowest portion of the obverse die and this die was polished up thoroughly before being placed into use. One will note that the die polish lines do not extend into the open fields, which would have been raised on the die, and instead are discontinuous with these fields. Had these been hairlines from mishandling then we would expect the lines to continue from the portrait right into the fields in an unbroken manner. The 1963 DCAM proof shows no die polish lines and the portraits can be compared quite nicely while the 1953-D mint state coin is also free from hairlines, though the toning can make it difficult to see. Other coins that have die polish lines that may be confused for hairlines are 1940s era Mercury dimes, mid-1940s era San Francisco mint Washington quarters and any PL-coins. Lastly, here are comparative images of a medal with hairlines from a cleaning compared to a full FDC medal with terrific mint bloom. The cleaned medal was offered online with an image of the PCGS Secure holder and certification number and the image was obtained from the PCGS online certificate verification database. 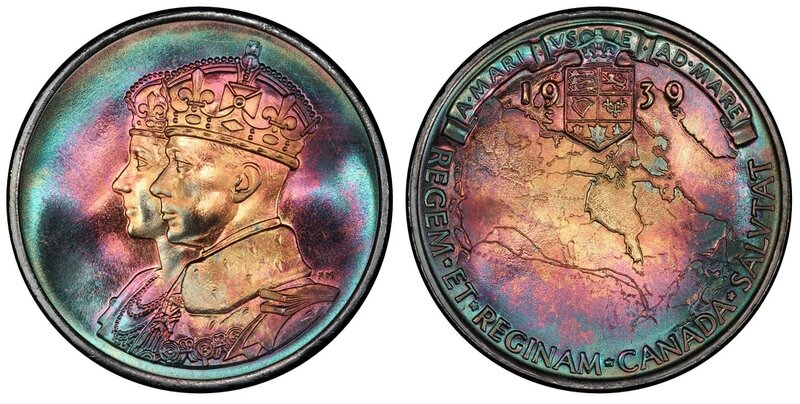 One can see the abuse of the cleaned piece and compare it to the pristine surfaces of the undamaged medal.